Excellent location ! Friendly owners ! Excellent facilities ! Amazing view ! Well done !!! The property was excellent and lived up to the pictures! The owners were extremely helpful and there was a cleaner who visited several times which was a real bonus. The views are spectacular from the lounge and the large lounge/dining room is just brilliant. We were two families and it worked well, but I think that it would be even better for a group of adults. The property was well equipped. The Villa is pretty new and really big, it has 5 bedrooms and large living room, good for companies. The owners of the Villa Michalis and Olga met us at a pre-agreed time at the Villa, all showed, treated Cretan vodka Grappa. The Villa has 3 bedrooms in one building each with its own bathroom. Fourth bedroom with separate entrance. The fifth bedroom is two separate beds, not separated by a door from the fourth bedroom. Every two days a full cleaning was done by Maria, who speaks English well and cleans like a God. The pool is small but nice. 3 areas for General gatherings on the street and one large hall on the second floor. There are a stove and grill on the street heated with coal, which you need to buy yourself. There are a washing machine and dishwasher. Maria washed the dishes, but the laundry products you need to buy yourself. In the neighboring village there is a shop, but it is cheaper to go to Lidl or Sklavensis. A very happy holiday! Maybe we'll come back again. 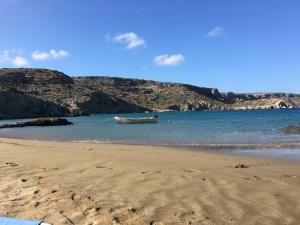 Warm reception from hosts Olga and Michalis, great relaxation place, can highly recommend! We had the best holiday thanks to our hosts who always were ready to assist and guide us to the nice places in the region. Villa was exceptional for big family's, we felt at home. Amazing holidays spent in Villa Panorama... fantastic location and all that you may need for carefree vacations. 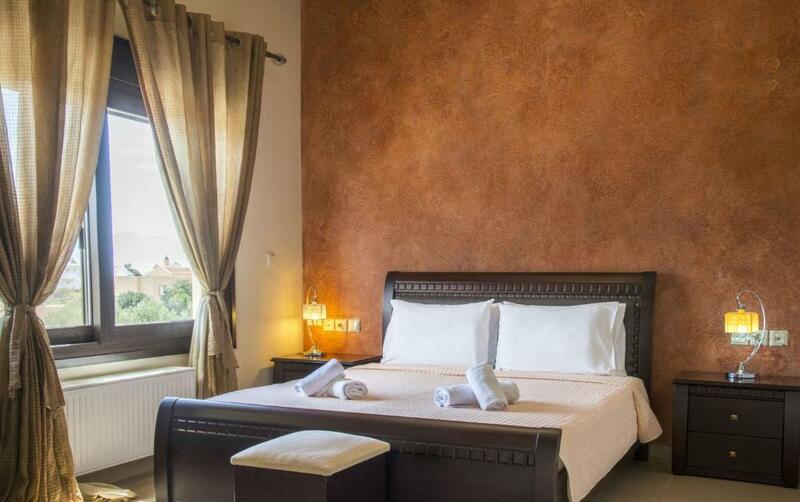 The owner is simply amazing and always at your disposal to make your stay as comfortable as possible. 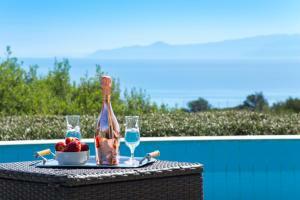 We have started thinking to spend our next holidays in the near future at Villa Panorama! Our guests were very nice. They always helped us with a recommendation, being willing to assure us the best Cretan experience. The location was very good: large living room, full equipped kitchen and, especially, beautiful view. The villa was lovely. Bedrooms were all a very good size, and some had a walk in wardrobe too. 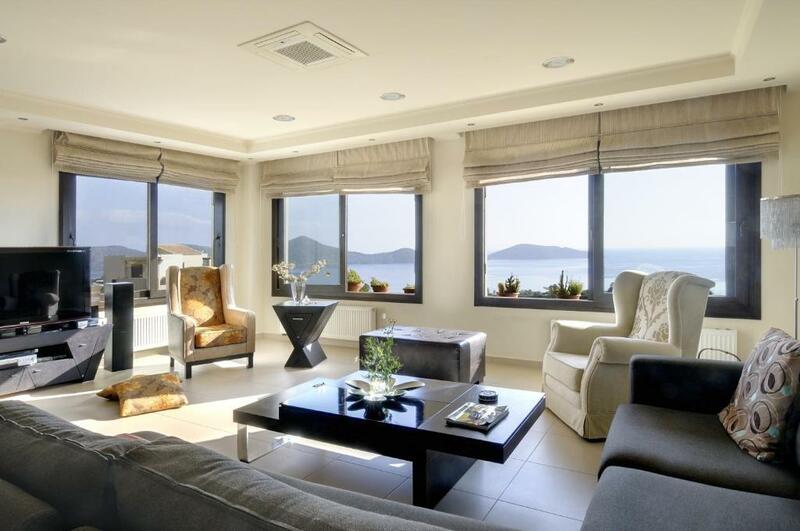 The villa had huge living room with beautiful views of the Bay. Pool area was nice to relax by. Overall it was the prefect villa for 9 females. The property was self catering and had everything that you needed. 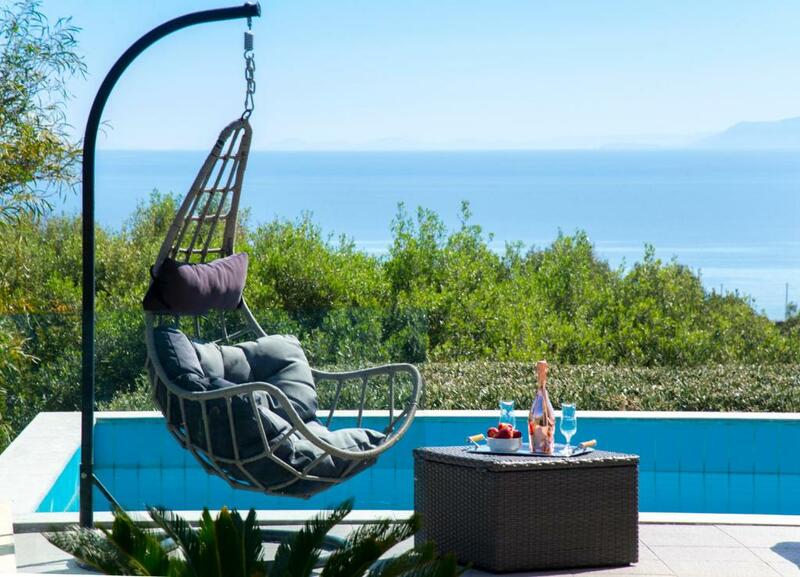 The villa is large and the outlook to the sea is fabulous. The maid came in every other day, beds changed, fresh towels & laundry hung up, and the place was spotless. (she even bought us homemade cake) Plenty of sunbathing areas around the villa. Lovely sized pool. Built BBQ. The owners were lovely and went out of their way to help, leaving easter gifts/chocolate for the kids and bringing us charcoal for the BBQ. Lovely lovely villa. 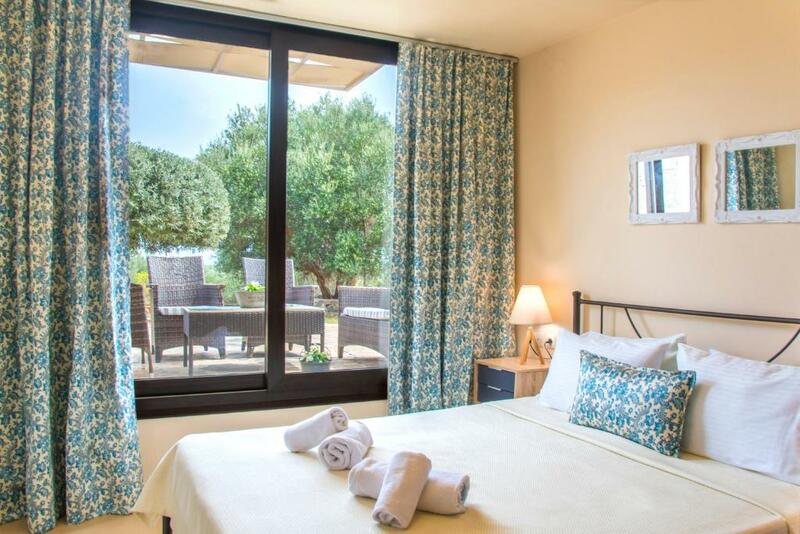 Lock in a great price for Villa Panorama – rated 9.2 by recent guests! Within 0.9 mi from Elounda Resort Center, Villa Panorama features a private swimming pool with a sun terrace. It offers a children’s playground and a garden, while free Wi-Fi is available in all areas. Opening to a balcony with pool and Cretan Sea views, the contemporary-style villa comes with air conditioning, a satellite flat-screen TV and a DVD player. It also has a washing machine and a kitchen with a stove, fridge and dining area. The bathroom is stocked with a bath and hairdryer. Guests can prepare their own meals at the on-site BBQ facilities. 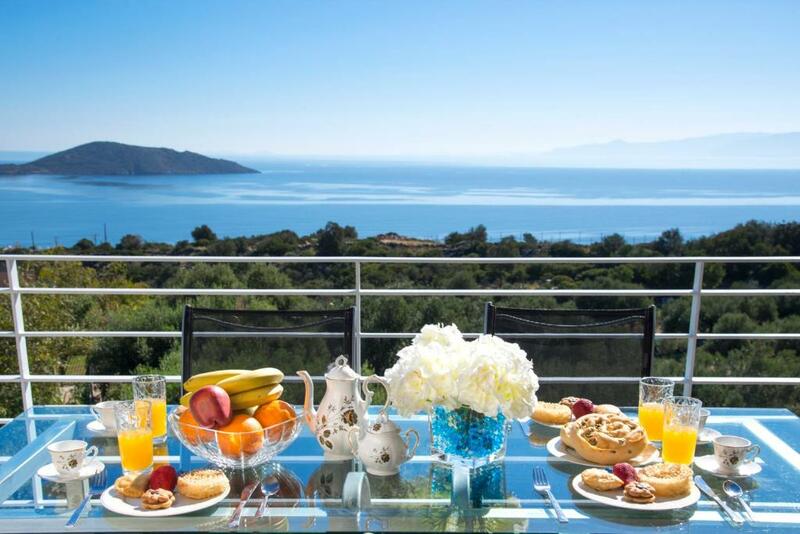 Villa Panorama is 350 feet from a supermarket, and 1,650 feet from an array of restaurants. Agios Nikolaos Town is 4.3 mi from the villa. Heraklion City is at a distance of approximately 43 mi. Free public parking is possible on site. This villa includes a separate apartment with its own entrance. Villa Panorama is a beautifully located on the hill overlooking the famous Mirabello Gulf and the Spinalonga Island. It accommodates families or groups in five bedrooms. Additional guests might also use the sofa beds in the living room. The maximum occupancy is 12 pax. 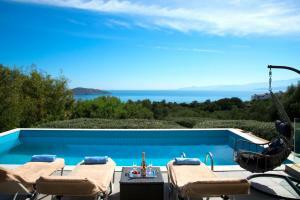 The swimming pool offers wonderful views and plenty of sun beds. The villa id fully equipped and one can feel as at home away from home using the organized kitchen, BBQ facilities, laundry machine, iron etc. Daily housekeeping is provided at no extra charge. Villa Panorama accepts these cards and reserves the right to temporarily hold an amount prior to arrival. A daily maid/cleaning service is provided. Breakfast can be served, upon request. Fantastic holidays for 12 guests! We were a huge group of guests 3 different families of 4 members each ! We arrived late at night and the owners was waiting us with a very warm welcome and so many goodies on the fridge bought especially for us ! They gave us also a variety of delivery so we order on the villa late at night ! Each room was so specious even for those that we had to put an extra bed ! The place was spotless , so clean and the view was amazing ! From every place you are facing the blue of the sea and the sky ! The panoramic view is breathless !!! The cleaner was so kind and she brought us one day some cookies that she baked for us ! We had the chance to have a private boat with a bbq on a private beach with crystal blue waters ! Thank you so much for the advice Michalis and Olga ! We only regret that we booked for few days ! We definitely will be back to enjoy our dinner under the olive tree on the main yard once again ! Villa Panorama is a unique place and taken care by the owners with extra care for the guests ! We really felt blessed ! Well done ! We arrived at late night and in the morning we found that the toilet in one of the bathrooms was unclean so we couldn’t use it. I sent a text to the owner asking kindly to send a cleaner to fix it. Then the owner arrived himself starting arguing with us that this is impossible, toilet has been cleaned prior our arrival. He didn’t wanted to come in and see it so I told him that I have a photograph of it. Then owner told us “I want you to leave my villa now”. We had to spend more than 6 hours on the phone with Booking.com that day to make sure the owner will let us to stay. It was extremely stressful experience as we were 5 adults with 3 kids under 4 booked this villa and paid it in full few months in advanse. This is absolutely unnaceptable to threaten the guests to throw them away for no reason. The owner explained to us that he don’t want us to leave the low rating for the cleanliness of the house that’s why he wanted us to leave. He even tried to blackmail us asking to leave the good comment on the villa right now if we wanted to stay. Booking.com reassured us that he can’t throw us away, but it still was very uncomfortable and unsafe feeling to live there. During the rest 3 days of our stay we had small things that we would normally call the owner to ask what to do, like problem with garage remote or hot water absence etc but we had to deal with that somehow ourselve because we didn’t know what his reaction will be. If it was 30 percent cheaper, we'd fall in love with this place. Not all light worked, some equipment needs to be repaired. We had many problems with the villa and we always were the ones to blame for all the problems. From the beginning till the end of our trip, we had the Fridge defrosting on regular occasions (according to the owner, it was us who didn't close it properly all the time), washing machine leaked, the smell of sewage from it, no electricity (according to the host, it was us who plugged something into a socket and it caused the problem. As we were switching on and off all the connected items, we found out it was one of the lights which caused the power cut). No customer care, no receipt of payment of the balance, the shower door fell on one of our elderly guests and incurred multiple of cuts and bruises. Instead of an apology, we were blatantly told to pay for a new shower door 500 Eur. No investigation was done, the host assumed that we smashed the door by opening it. We submitted detailed pictures to booking.com to prove that the door collapsed due to poor installation (the holding bracket in pvc has cracked through and the screws could not hold it any longer). They refused even to consider that it was their fault and the payment of this made up sum was demanded. They even suggested for us to cancel our reservation through Booking.com, so they could avoid paying commission and cover the cost of the damage. We had a huge argument, we were shouted at in front of our children, who got very scared. The whole experience was a disaster. We refused to cancel our reservation and the next day the police arrived to our villa. We were afraid that we would be asked to leave the property as there was no proof that we have paid the balance on arrival, as no receipt was given. Then we got email from Booking.com, that the host is trying to cancel our reservation, blaming us that we were destroying the villa (the list of destruction included cutting marks on the cutting board and the curtain caught in the window) We have proven to Booking. Curtains in the rooms could have been thicker- We were woken up my beaming sunlight. The one hairdryer provided was not working.